Cleaning your RV can be a daunting task, rewarding in the end, but a pain nonetheless. You’ll want to be using cleaning agents that are eco-friendly, reliable and last you long enough. This article will help you find exactly that. The following article will highlight to you the best cleaning products on the market. There are certain qualities that every cleaner should have that will make them fall under the category of a great cleaner. The following section will discuss those certain qualities. The best cleaning products out there should be eco-friendly. Doing your part to save the environment is very important, what’s even more important is not getting fined. A lot of products out there boast ‘potent’ and ‘strong’ cleaning properties, most of the time they’re toxic for the environment by emitting dangerous fumes and scorching the environment if they’re ever in contact. Many states will ban these products so it’s important you stay clear of them. Quite similar to our previous point, many products out there are also dangerous to humans with their poisonous fumes. If you are going to use these products, make sure to wear a safety mask and gloves when cleaning and ensure that they’re even legal in the state you’re using it in as many of these products can be emit cancerous fumes. A great product is always reliable. Check the recent reviews of every product before you buy them, you’ll want something that does the job without any hassle. If it does exactly as it says on the tin, you’ll be sorted. Sometimes forking out some extra cash to get the best reviewed product is more than worth it. Many of the external cleaners should be protected against the elements like rain which could easily rinse any low-quality wax, cleaner or polish off your RV. These products should also helps protect your RV against the elements by being waterproof and help bring back color from a discolored RV. The review is one of the most important section, this is where we can discuss in more detail some of the best products currently on the market. The following section will discuss the various features as well as the various pro’s and con’s of each product. 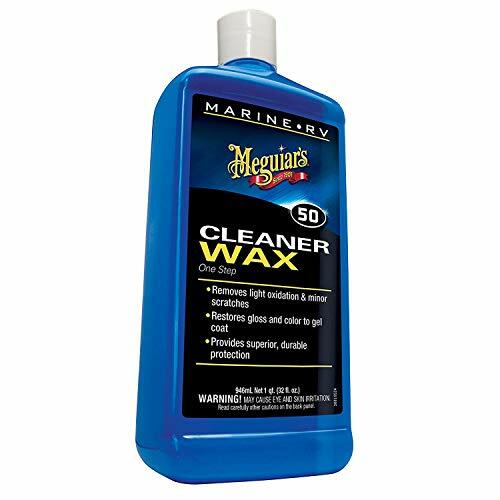 This product is the best overall cleaner currently on the market for your RV. 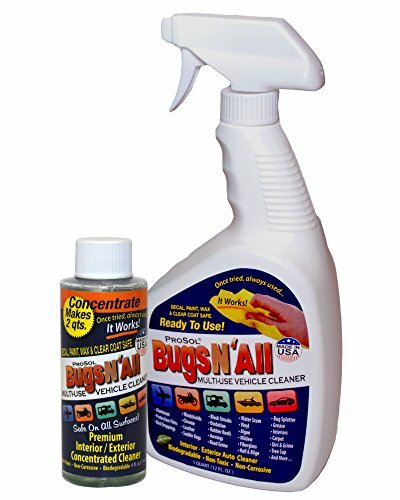 What makes this product so great is that it cleans any dirt or bug splatter in just 60 seconds. It does this while leaving any wax or protective layers on your RV. Not only that, it also cleans off those nasty water marks and helps oxidation relatively fast. This product can clean almost everything from bugs to grime as well as limit the smell of bad odors. The eco-friendly formula is safe around everyone and everything as it has no deadly chemicals and is fully biodegradable. The formula comes in a spray bottle which helps with the application on to your RV. This product was voted the overall best for a good reason, it cleans almost everything. Which is exactly what you want in an RV cleaner. It also doesn’t clean off any protective coatings you’ve recently added so you want need to re-do anything. The oxidation and water marks are no match either, which should be standard for all RV cleaning products. Like we mentioned, being eco-friendly and safe are also a huge deal and that’s exactly what these products are, they can also be sprayed on fairly easy which makes your cleaning process so much faster. The only downside is that the amount you’re given won’t last long until you need to restock. This RV black tank cleaner is currently the best on offer anywhere in the world. It has so many promising features. This formula is able to clean any waste that’s blocking the black tank sensors by dissolving the waste in the matter of hours. The products are also eco-friendly and don’t emit any harmful gasses. All you need to do is pour in your tank cleaner and some gallons of hot water into the tank and it should dissolve the remaining waste within 24 hours. The reason why it takes up to 24 hours is because this is an enzyme and bacteria based product which takes its time to effectively dissolve that waste so you don’t have to continuously try and dissolve it. This black tank cleaner is one of the most reliable and effective black tank cleaners on the market. The enzyme and microbe based product works up to 24 hours to successfully dissolve any waste that enters your black tank and is blocking your sensors from working. This formula is eco-friendly and doesn’t harm humans which is a huge benefit, of course. The only downsides are that it takes as long as 24 hours and the bottle only contains two treatments. However, you should only be treating your black tank at least twice every year. 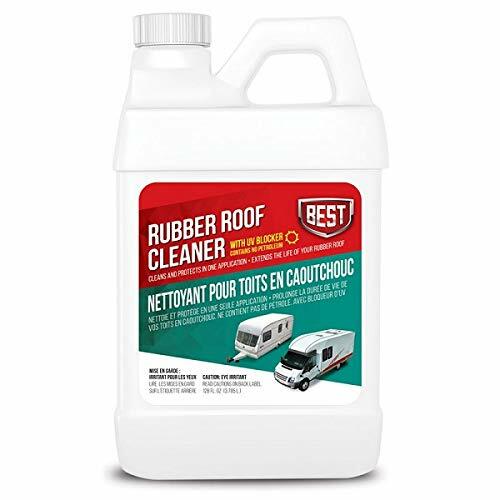 This 48 oz bottle of rubber roof cleaner is the best cleaner and protectant currently on the market for rubber RV roofs. What it does is extends the matt quality of your roof by protecting it from harmful UV rays and the environment. The non-harmful formula provides you with a professional strength cleaner that will last you a long time. 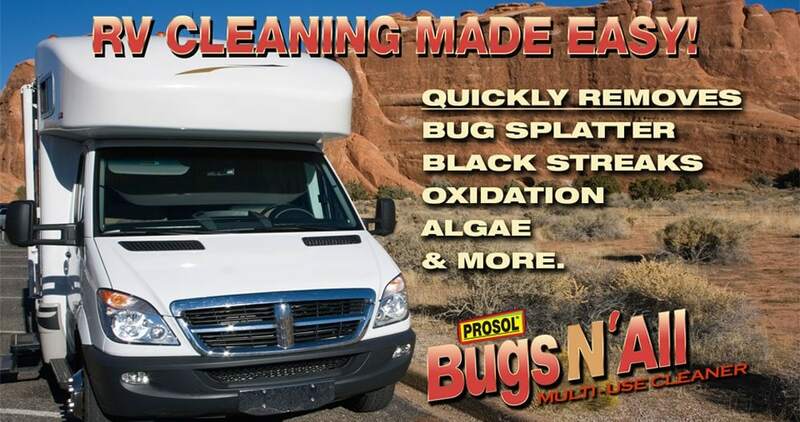 The effective formula helps combat mold, fungus and mildew growth which can be devastating for an RV. This product is one of the best currently out on the market at it effectively extends the quality of the rubber roof by acting as a protectant against UV rays that will discolor and fade your roof. Not only that but it limits the growth of mold and fungus which are two huge problems for any RV. There’s only one downside with this product and it’s quite scary; if you look hard enough you’ll come to learn that this product has a warning which was created by the California government as it can create cancer causing fumes. So, before buying this product, please do some more in-depth research and understand what they mean by this. This product is the best roof cleaner on the market as it will be able to be applied to every known material that’s used for RV roofs. It has a long list of great features including the help it offers to protect against cracking, dry spots and oxidation. This product is free from any harmful chemicals and oils that might damage you, your RV or the environment. Once the product has been applied, it won’t need to be reapplied for at least another six weeks, the product also acts as a protectant against UV rays, mold, fungus, dust and water marks. This is without a doubt, the best product for your RV’s roof at the moment, it’ll clean any roof material that is currently used on RVs. 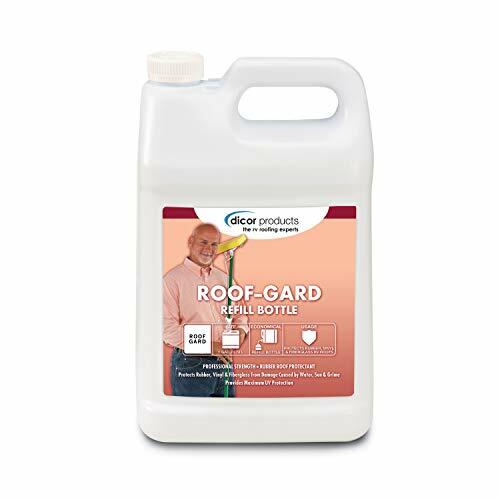 Another benefit is the fact that it uses no harmful products that will eventually degrade your roof over time, the product even works as a protectant as well as a cleaner which is even more beneficial in many ways. The only downside is that having to use this all over your RV roof every month is quite time consuming, there are protectants out there that can last for months. To clean your awning, you’ll want to use this cleaner for sure. This product will work wonders in cleaning all the mold, mildew, dirt and grime from your awning with complete ease and zero hassle. Regular maintenance will make this feature look brand new everytime you bring it out. The easy application is really as simple as spraying it on and then hosing it off. The product can work on vinyl, synthetic and natural fibers as well as acrylic. This product also acts as a great protectant against UV rays that will eventually damage the material as well as limit and further growth of mold or fungus if applied regularly. This product is without a doubt the best currently on the market for cleaning and protecting your RV awning. The easy cleaning process makes the time spent on this bare minimum. Not only that, it works on most materials used to create awnings which means that this product is super versatile. The only downside is that for it to work as the great protectant that it is, it needs to be regularly applied at least once per month. If this happens you’ll limit the growth of bacteria and fungus as well as be protected against UV rays. This fiberglass roof cleaner is non-abrasive and has a three in one function as it cleans, polishes and protects your fiberglass gel coat surfaces. This protection is effective against most, if not all problems faced by RVs like UV rays which can discolor, small stones that create scratches and even dirty water marks. A regular application ensures that your RV fiberglass surface looks brand new as though it came right out the showroom. The product also successfully removes light oxidation, swirls and minor scratches already on the RV. If you use this cleaner, you’ll have your vibrant RV colors back again. This product comes as a three-in-one function and offers effective protection against all things that are out to get fiberglass RV roofs. You’ll have the benefit of being able to restore light oxidation, swirls, dirty watermarks and even fix minor scratches as well as defend against further scratches. The product even restores the vibrant colors of the RV to make it look brand new again. This is exactly the product that you want. However, not all good things last. There are a few downsides to this product, both of which are really serious, this product contains petroleum distillates and is also emits harmful fumes that should be avoided at all costs. This toilet cleaner is some of the best that money can buy at the moment. With this product you’ll be able to clean your toilet safely and even enhance the breakdown of waste within your tanks which decreases the likelihood of any blockages or problems further down the line. The formula used is a concoction of beneficial bacterias that speed up the waste process. This product is also strong enough to remove serious stains from most toilets and helps with any bad odors that are coming from your tank. Another key feature is that it’s safe for you, your system and the environment. This product has a full range of benefits like the most important being that they product is eco-friendly and human safe. The beneficial bacteria that are used help dissolve the waste efficiently while also helping block out those bad odors coming from the tank. These are all great benefits that most cleaning products could only dream of having. The special formula is even strong enough to remove stains, which is rare for bacteria based products to do. The only downside with a bacteria and enzyme formula is that it takes longer to react than most other products on the market. 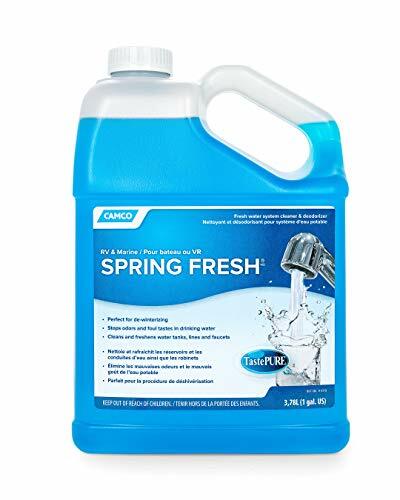 One of the easiest fresh water tank cleaners to use, you simply pour this full one gallon bottle into your holding tank and you’ll be able to treat up to 100 gallons of water. It works tirelessly to stop bad odors and foul tastes within your drinking water by cleaning and deodorizing it. We all know how disgusting it is to put up with foul water and how risky it is as well. This product will make your water 100% safe with no foul aftertaste. You can also use this formula to dewinterize your full system. This tank cleaner will certainly do its job and effectively clean and deodorize any foul water that’s being held within your holding tanks. Not only can it provide you with clean water but it can dewinterize your entire system to be prepared for your summer travels. This RV drain cleaner will flush all of that decomposing waste from your entire system with only the slightest of effort. The eco-friendly, non-toxic formula is safe for all pipes as it will deodorize and dissolve any problems that it comes across, leaving your pipe system spotless. If you use this formula continuously you’ll be able to maintain those blockage free pipes. The product comes in as a 1 gallon or 32 ounce bottle. The formula uses bacteria and special enzymes to break down the waste with 100% effectiveness, these same bacteria also stop any bad odors from coming out through the pipes. This effective product is the best drain cleaner than you can get, it works by dissolving any remaining waste that’s blocking your pipes, the deodorizing properties then get rid of any bad smells before they spew out your pipe system. The eco-friendly and non-toxic nature of this formula is also another huge benefit as you’ll never need to worry about harming yourself or the environment. The bacteria and enzyme formula is a great way to fight back against waste blockages and they’re extremely effective as doing so. However, this formula takes a while to start working as it’s a mixture of enzyme and bacteria. This coil cleaner is the most effective cleaner currently on the market. What makes it so effective is that the Evap foam will liquefy any dirt, grease, oil and any other residues almost instantly. The product is also quite versatile as it can be used on other metals and materials due to the corrosion inhibitors. If you’re worried about leaving a mess, don’t be, because the foam is also self-rinsing. The cleaner is also great at deodorizing those foul smells and replacing them with a fresh scented lemon smell. You don’t need to use this on the coils of your RV it can also be used in other areas that might be near food as it’s NSF registered. 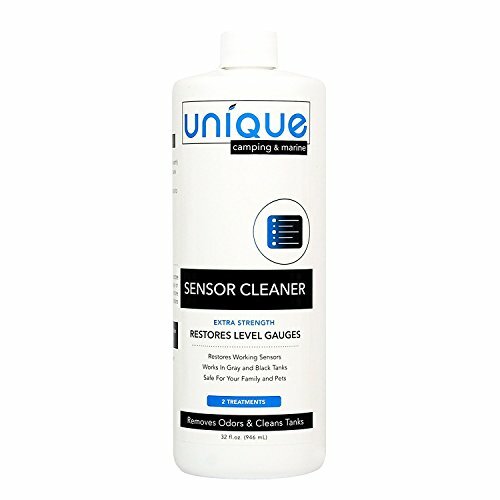 This product is amazingly effective at removing oil stains and other pieces of grime attached to the coils of your RV. Not only that, it can be used on different types of metals and materials without damaging them. The way it works is by liquefying the grime and dirt, this then washes itself off so you don’t have to worry about leaving a mess. It’s also safe to use around food and even deodorizes any foul smells given off by the dirt and grime and replaces them with a lemon smell. The only downside to this product is that it runs out quite quickly. There are plenty of reasons why you should exercise extreme caution before buying RV cleaners. Here are a few reasons why you need to think about the risks. Like we mentioned previously, there can be certain chemicals that might seem harmless if used separately, but, once used together as a formula, can become an extremely lethal concoction if used in the right environment. These cleaning products can be just as dangerous for humans as they can be for the environment. Many products might include CFCs which cause significant damage to the ozone layer and create greenhouse gasses. They’re now illegal in the US which is a huge bonus, so make sure when you’re getting those old cleaning products out the garage you aren’t breaking the law and destroying the environment. Phosphorus, nitrogen and ammonia are all chemicals that can destroy plant life and harm animal habitats if they ever come in contact with one another. It’s clear that there are plenty of cautions to take notice of when using cleaning products, both for your safety and the environments. It also doesn’t take much to know you’ve got a decent RV cleaner. We hope that this article has helped you choose the best cleaners for your RV. This section is for all those people that are still left wondering about certain aspects to cleaning your RV, so, we’ve compiled a list of the most commonly asked questions and answered them to the best of our knowledge, we hope this helps. Are RV Cleaners Safe to Use? They’re safe to use if you know what chemicals are inside your products, you should be avoiding all of the chemicals that we mentioned previously. These are all the main harmful chemicals and there are far many more so if you conduct some more research you should find what you’re looking to avoid. How Often Should You Clean Your RV? It depends on what you’re wanting to clean, if you’re wanting to do a full RV detox, you should aim to thoroughly clean inside and outside of your RV every three to six months. Some cleaning processes need to be done more regularly than others so make sure you know exactly by reading the instructions on the products. Can Cleaners Be Used On Any Surface? There are various types of surfaces that have specific cleaners that will benefit them. For example, fiberglass RVs will have a special fiberglass cleaning product. However, you can find all purpose cleaner. Do You Need a Protectant After Cleaning? It would be advised that you use a protectant after cleaning your RV. A good example would be cleaning your RV roof with a fiberglass cleaner and then adding wax which acts as a protectant against the elements as well as protecting against scratches or UV rays.